You can set your SSH port through the command line by editing the ssh configuration file ( /etc/ssh/sshd_config ) with this command. Note: if you are runnning a firewall on the server you will want to open the desired port before proceeding. You can now edit the configuration file. It will start something like this. Look for the line containing ” #Port 22 “. you will want to delete the # at the begining of the line and then change the “22” to your desired port. When finished it should be like follows, but with your desired port. Make sure to note the new port number or use a number you will remember. You are limited to 5 digits and will want to select something between 5000 and 99999 as tehse are usually unreserved ports. Now hit “control + v” this will open a dialog box at the bottom of the window. “Save modified buffer (ANSWERING “No” WILL DESTROY CHANGES) ?” Press “Y” and then press “Enter” to confirm saving your changes. We will now need to restart ssh to begin using the new port. issue the following command. If everyhting worked correctly you will often get no confirmation. 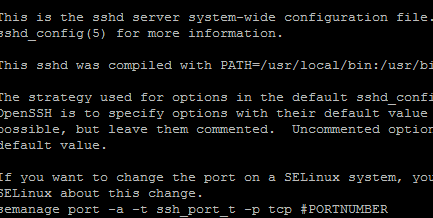 To test the new ssh port I suggest opening a new ssh connection without logging out of your current session.